As I continued my quest for inspiration and to feed my habit I joined BookCrash, a book review site for Christian Authors. 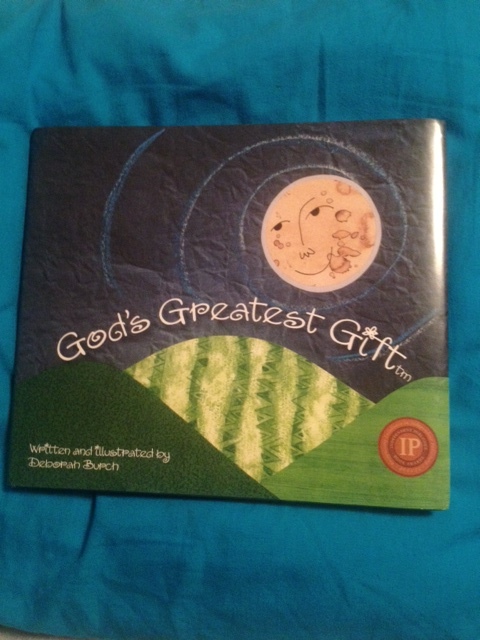 Recently, I had the opportunity to read God’s Greatest Gift, a book by Deborah Burch, provided to me by BookCrash. This was a book that came to my attention mostly by the title, enticing me to take a peek inside. What can I say? The eye-catching bright and bold colors speak loudly to the soul as if to be spreading sunshine and happiness to those who come in contact with it. The sturdy book was a graceful read with its rhythmic beat. In addition, it is beautifully illustrated with a rainbow of colors that keep the reader’s attention. But mostly, it is a book that teaches one of life’s most valuable lessons, that children are God’s greatest gift. It appears that the only reinforcement needed, is the parental contribution reminding that Jesus was foremost the greatest gift from God. However, a child is indeed a great gift as well. By planting a small seed in their young hearts, books like this can make a young child flourish by building self-esteem, providing hope and establishing a foundation of faith. Entwined in the books pages are hidden treasures, counting games for the children to play along the way. God’s Greatest Gift is a book you can read as a family that will provide lasting memories and leave you with a feeling of love and peace. There is no doubt, that next to Jesus, children are God’s greatest gift. Thank you to the talented Deborah Burch for sharing your gift and creating such an incredible contribution to the children that will leave impressions of a lifetime. Your review makes me want to have a copy to share with Xander. I’ll search for it or look back through your page for a hot link. Love and Happy New Year ahead to all…..